Check the hardness on the glassy stuff. 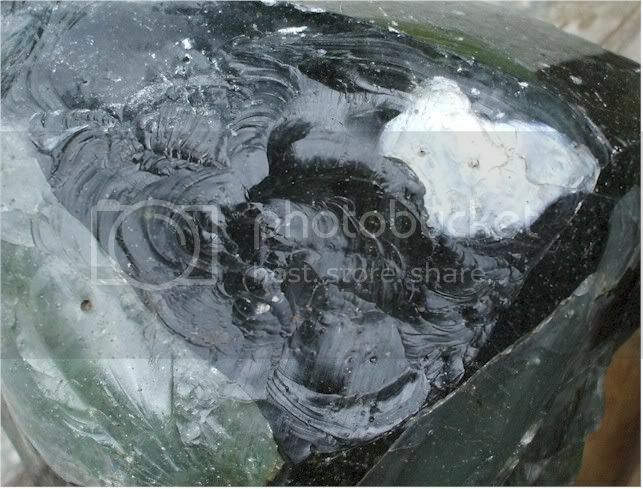 Looks almost like glass slag. The second one looks like fossilized Worm holes. Does the green stuff streak? 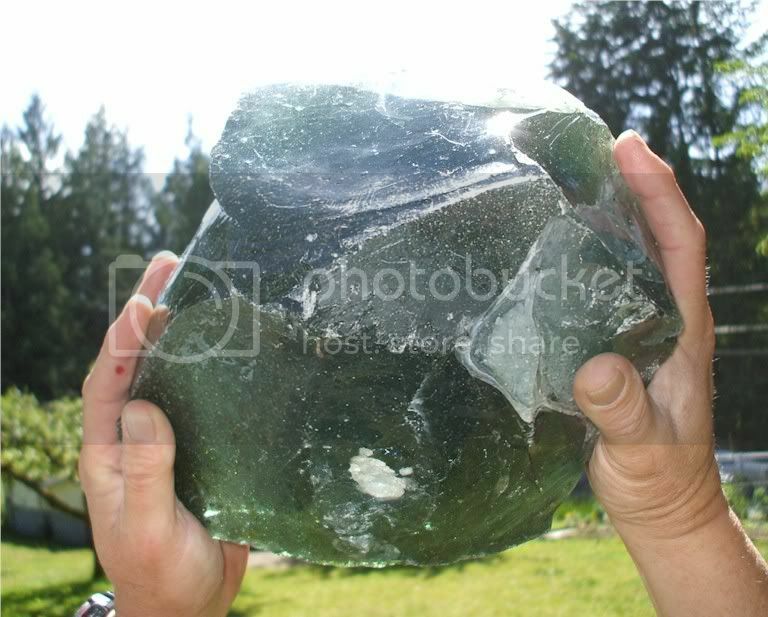 WOW Johnno, I never knew there was such an animal as green obsidian. It sure looks like slag glass. I've seen lots of black before but not green. Must be pretty much like man made glass. Glass will be between 5 and 7 in hardness. Obsidian above 5 - 7 most times. NO BUBBLES. 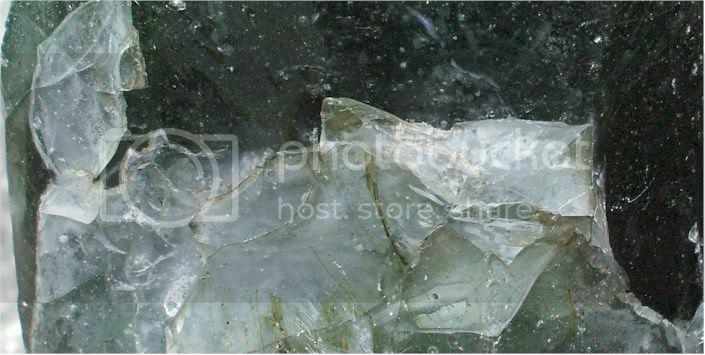 Homefire, I was born an raised in the glass business back east thats why I tend to say glass it sure looks like it. through the blackberries to get down to the creek, and it was in a narrow gully. and a streak test and hopefully that will let us better determine it's true ID. I've seen a lot of obsidian in my time but never have I been able to see bubbles in it. Have also never been able to shine a light through a 9" thick piece of obsidian and observe a glow. 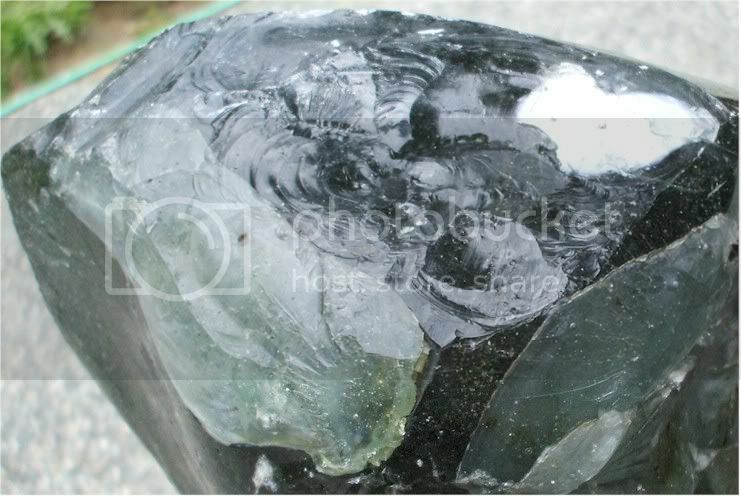 While obsidian is translucent, you can only observe it around the edges. My guess is it's glass. :twocents: A streak test wouldn't tell you much since obsidian or glass doesn't leave a colored streak. The most you will see is just a white line. And what if it streaked green? I don't think any glass is going to streak other then white perhaps. Green glass shouldn't have a green streak anymore then black glass is going to have a black streak,etc. Unlike the piece in the picture, all obsidian I have seen has been very dark and is hard to detect bubbles just by looking at it. I looked up Sideromelane and it could very well be that but the color seems a little off. I think we need to know location! But then we would need geological data for that specific area! Hmmm. I have that for AZ but do not have the books for other states. The assumption is what the streak resolves. You are assuming glass or obsidian. Yes, they will streak white (powder) but if it streaked green then it's something else (olivinite?). That is what I was getting at. I was going to joke with Johnno about it being the olivine the was missing (fell out of) in the Tucson Ring! It is green glass. You can see the surface where it was cast against in the second photo. Obsidian does not have bubbles like that. Someone trying to fake a moldavite or something. Looks like an excellent piece to knock a few spalls off of and practice knapping. As I walked over to my neighbors I could see the crowded porch, meaning that a meeting of the CCOBS (Concrete Cranky Old Bastards Society) was in progress. With all the [wasted] years of wisdom present, we decided apply our cumulative knowledge to the problem. I still say it's glass but gotta muddy the waters. 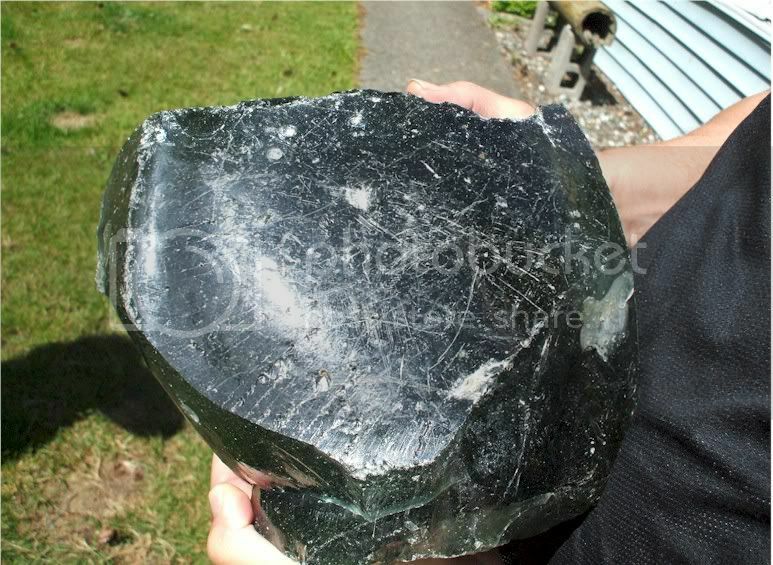 Obsidian can have an occasional bubble but they are usually larger. Numerous small bubbles is indicative of glass. crab pot and fishing net floats that were melted down. Why they did it is a question for another day. 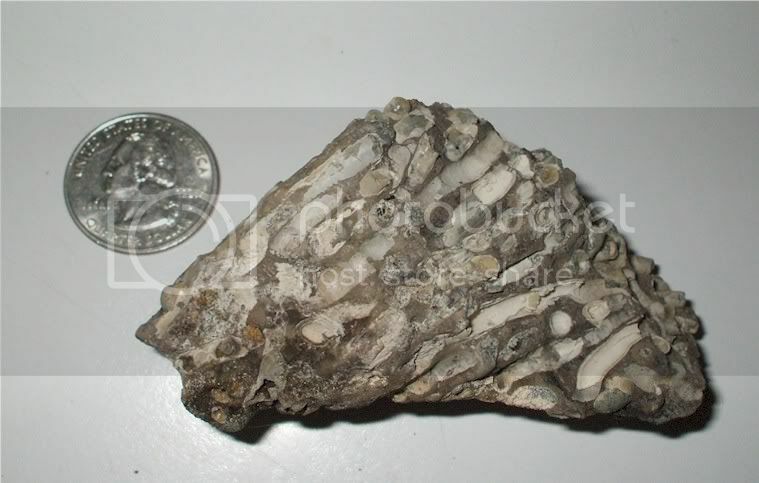 I guess glass slag is the best bet, there is greenish glass formed from lightning strikes in sand (fulgurites), but those usually are smaller and more opaque. 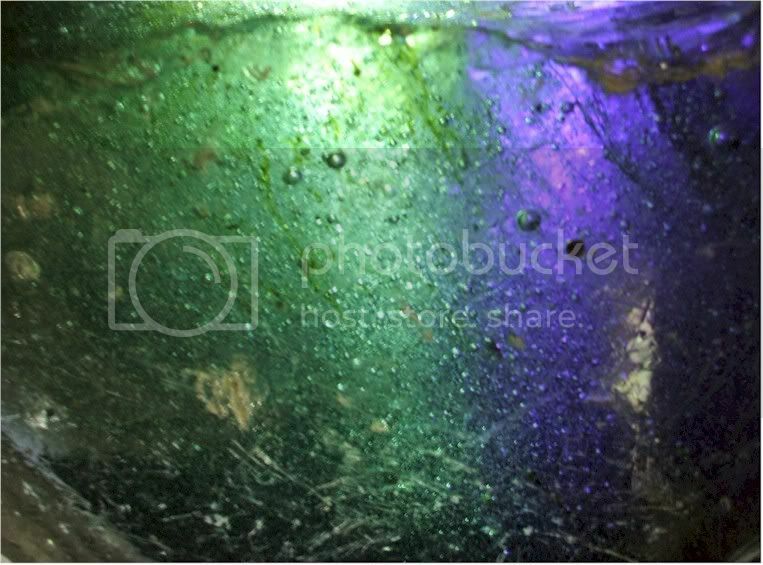 There also is at least one occasion where a meteorite blasted the Sahara desert and ended up forming green glass which is scattered in some area over there, but your piece would have had to have been created from a massive impact on the highest order for such a large piece. So, as I said, green glass slag sounds good to me.